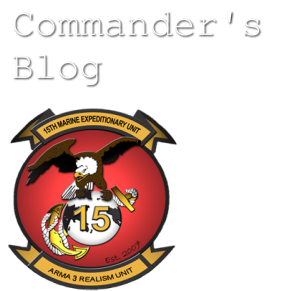 This blog is intended to be the random thoughts, ideas, heads up, and clarifications from Colonel J. Penny of the 15th MEU (SOC) Realism Unit. It is intended for things that could be clarified but don't warrant the space a Command Announcement takes up, or for the 'cluing in' of readers to upcoming changes or thoughts from the head of the Commander. Colonel J. Penny is the commander of the 15th MEU (SOC) Realism Unit. He has been with the unit since February 25th, 2008, and has been the person in charge since he became the Sergeant Major, and later CO, in mid-2010. He began his virtual career as a Combat Engineer, later transferring Infantry, then becoming one of the first three members of the new Machine Gun section. After a brief stint in Reserves he returned to Machine Guns as a Team Leader, and eventually became a Squad Leader then Platoon Sergeant for Weapons Platoon. Later he was promoted to First Sergeant of Echo Company, and after the departure of SgtMaj Tigernan he became the Sergeant Major of the Unit. A later shakeup of the command structure saw him replacing the original founders as the CO of the unit.